This tour shares some genes with another fine tour we offer: The Bigfoot Tour. 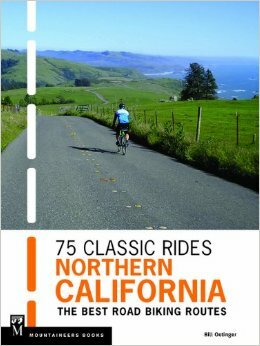 Both of them explore the same region: the far northwest corner of the State of California (with just a tiny sliver of Oregon thrown in on this route). It’s called the Wild Rivers Tour with good reason. It travels alongside or crosses several beautiful and (mostly) wild rivers: the Trinity, the Klamath, the Salmon, the Scott, the Illinois, the Smith, and the Mad. In addition to slinking along all those beautiful river canyons, it scrambles up and over a number of high ridges, tiptoes out along rugged, rock-ribbed coastal cliffs, and meanders for many miles through immense forests, in the shade of some of the tallest trees on earth. 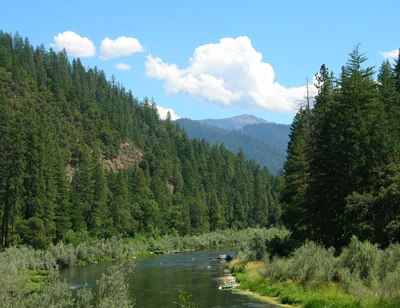 The tour runs through or near the Six Rivers, Rogue River, Klamath, and Siskyou National Forests and the Trinity Alps and Marble Mountains Wilderness Areas. It visits numerous beautiful state parks and Redwood National Park. It’s essentially a loop route. Not quite, but it can be made to work that way with a little logistical shuffling about. Easy miles through the Hoopa Reservation, first along the Trinity River, then—slightly hillier—along the Klamath. Then a lively uphill along Ishy Pishy Road, followed by an equally lively descent, and finally, best of all, the run up the narrow, rugged Salmon River gorge, one of the best cycling adventures anywhere. Overnight in a forest service camp. No showers, but a great swimming hole. Further up the Salmon River and then up and over the huge, out-of-category Etna summit (5958′). 25 miles of rolling uphill to start, then eight miles of serious, concentrated ascending…hard work! But a monster descent off the far side—great fun—and then mellow miles through woods and farm fields to another primitive forest service camp on the lovely Scott River. Again, no showers but great swimming in the river. A busy, interesting day, beginning with a long, gradual climb along the State of Jefferson Scenic Byway. At the 4750′ summit, you drop off the other side into the state of Oregon, launching off into a big, fun descent into the valley of the Illinois River. Your very brief sojourn in Oregon includes a stop in the tiny town of O’Brien before you hop back over the border into California. A neat little climb and rockin’ descent over remote Hazel Dell summit brings you to the last, long descent along the Smith River to another forest camp. And although this one has nice river access, it also has showers. More nice, mostly downhill miles along the Smith to get things rolling, then a meandering transit of Crescent City, including a run along the town’s scenic ocean frontage. South of town, you have to get to work on a long climb from sea level to an unnamed summit, seven miles and 1200′ later. After a run along the ridge line in deep redwood forest, a big descent brings you to one more encounter with the Klamath River. Then it’s out to the coast for a real walk on the wild side: an exploration of a stretch of gravel road hanging off the side of the cliff in Redwood National Park. Pavement returns for the last miles of the ride. Spend the night at a campsite in the park with all amenities. A short, easy stage, allowing you to grab a shower (at the YMCA in Arcata) and hit the road for home after the ride. Short, but not without its points of interest. Many miles along quiet side roads through parks, woods, and farm lands, a visit to the picture-postcard village of Trinidad, and a pleasant run along a bike path near the beach, including a bike bridge over the Mad River (the last wild river of the tour).